Aecht Schlenkerla Rauchbier Urbock by Schlenkerla Brewery (6.6%): Now we are in a totally different teritory. It is a "rauchbier" which can be translated as "smokebeer" in English and comes from Aecht Schlankerla brewery in Bamberg, Germany. The brewery is located in the basement of a cathedral and used to brew their products in 15th century only to be sold in the Tavern Schlankerla right above them. So, the beer is still produced there but can be found worldwide in 16.9oz bottles. Look: Clear, dark brown body with an offwhite, dense head. Nose: Bacon fat, crispy chicken skin, smoked salmon, pickled bonito. Seaweed, roasted malt. Palate: Where did everybody go? To be honest I was expecting a bigger bonfire party. All the smoke got thinner and replaced with amplified roasted malt and charred oak at the palate. A little bit salted fish is still there. Sweet, sour and spicy. Quite nice. Overall: Beautifully balanced and drinkable beer. I feel like eating something with it though. At least pretzels with mustard but ideally I would like to pair it with smoked fish or roasted peppers. 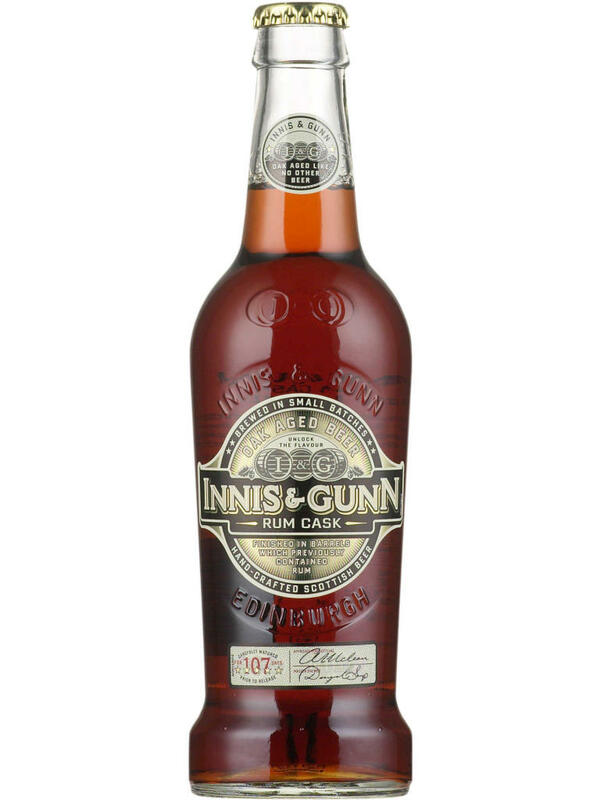 Innis & Gunn Rum Cask Finish Oak Aged Beer (7.4%): I was visiting Edinburgh in May 2010 for a few days for some meetings and when we were out for lunch with friends they were so excited to introduce me a special Scottish cask aged beer called Innis & Gunn. We tasted some different expressions but I remember liking the rum cask finish at most. We all felt like tasting a rarity that time but in less than two years the brand got so popular, now I am popping up the bottle I bought from my neighborhood deli in Bed-Stuy, Brooklyn today. Look: Clear deep red plum color with white firm head. Nose: Sticky toffee pudding with sweet malt. Ripe pear and nectarine. Palate: Spicy rum cocktail, dark 'n' stormy and lightly charred oak barrel. Raw cashews, raisins and prunes. Lovely bubblegum taste with the finish. Overall: Because it got very hip in a very short period of time it also became a magnet for negative reviews online but I don't think that being popular is a bad thing. The beer is delicious. Even as a person who doesn't like sweet beer expressions very much I enjoyed it big time.